Quilt, Knit, Run, Sew: Just try to pick these pockets! We're heading to Europe in a few days for a great historical vacation. The first part of our trip we will be staying in Rome. We are very excited about all the historical places, sites and artwork we're going to see. Recently we read in the news that Rome is a haven for pick pockets. We've also been reading and following Rick Steeves guidebook on Rome. He cautions many times in his book about how to protect yourself from pickpockets, and how to spot them, and how best to avoid them. So, because I'm all paranoid about them, we're taking extra precautions on our important stuff, credit cards, passports etc. In addition to the common sense things Ricks says, this morning, I sewed inner pockets on our jeans to hold some valuables. They're going to be hard for us to get at let alone pick pockets. 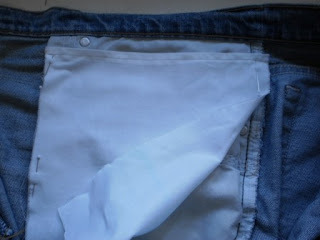 First - put a simple hem on a rectangle of light fabric the size of the inner pants pocket. This will be the top of your inner pocket. For my quick inner pockets, I chose not to hem the sides. I just left them raw. If you are more ambitious than I am, You could hem. Next, lay this fabric over the pocket on the inside of the jeans. Pin all around the pocket and make sure you can feel that you have an area where you can sew around. Because there were bar tacks for a belt loop, I lowered the pocket a bit for ease of sewing around 3 sides. 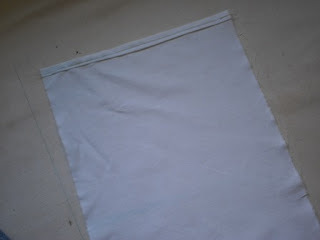 After pinning, I trimmed away the corner of the lining that followed the inner pocket's curve. Next, I sewed in two steps. I sewed along the inner seam of the jeans. It's a thick seam, but it's not too thick to be sewn through. Then I sewed the other two sides which are actually on the inner cotton pocket itself. Here you can see my completed security pocket. You an see the outline of our passports in this pocket. I put safety pins on the pockets instead of a button. Remember, these pockets don't have to be fancy, just effective. Great idea, and also check out PacSafe. They have great wallets and purse/bags that are slashproof. We just came back from Paris, another pickpocket haven, and we had not problems, and I felt vey secure about my stuff. We never had any problems and I felt very safe, but good to be cautious. Have a great trip!! Fantastic time of the year to go!! Very clever! I love any kind of ingenious sewing! Thanks for this great post. I will definitly be doing this before my next trip. Great idea! You could put velcro at the top instead of pins for an easier (for you) to open option. Great idea! You could put velcro at the top of the pocket as an easier (for you) option to access the pocket instead of pins. 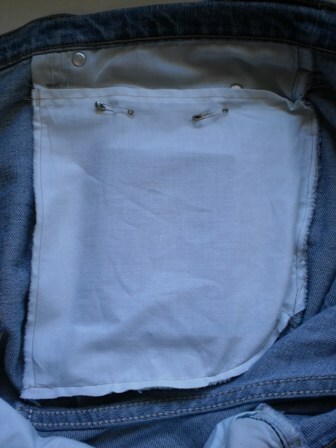 Years ago I made a similar type of pocket that I could use with different pairs of pants or skirts. I put about 6 inches of the soft side of Velcro onto the waistband (so if I wasn't using a pocket it would be soft against my skin), then made a pocket and put the loopy side of Velcro at the top. I never had a closure on the pocket, but I did make a couple of tucks in the top of the pocket that didn't have the Velcro. That way I could get into it fairly easily. On long trips if I bought new pants, I could hand sew some Velcro to the waist, and still had the same pocket. If you're in a real sketchy area, you can even put Velcro on the inside of your pj's.